Lisichansk, Luhanska Oblast. Damage incurred when the Ukrainian army drove separatist forces out of the city in July 2015. Photograph by the author. After nearly two years of war, the contested Donbas region in eastern Ukraine is split in two between the Russian-backed “People’s Republics” of Donetsk and Luhansk and the so-called podkontrolny (under control) Donbas. There is much analysis of how Ukraine might reintegrate the separatist-held territories, by peaceful or military means. But it is no less important to understand Kyiv’s relationship with its own, podkontrolny Donbas. Military and political control over this half of the region was successfully restored, but the process of internal reconciliation and of addressing residents’ political alienation and war-induced trauma is far from complete. To achieve internal reconciliation and move forward, Kyiv must rethink its strategy in the region. Policies that complicate or endanger the lives of waraffected civilians must be abandoned. So too must ideological litmus tests that would exclude Donbas Ukrainians, with their distinct political culture, from the emerging Ukrainian civic identity. If all this can be accomplished, then the podkontrolny Donbas could become a testing ground for the next step, the enormous challenge of reconciliation and reintegration with the Russian-supported People’s Republics. If it cannot be accomplished, then the social strife evident in the Donbas today could far outlast the armed conflict. The rest of this article lays out several steps toward achieving the twin goals of internal reconciliation and civil integration of the podkontrolny Donbas. Fig. 1. Severodonetsk, Luhanska Oblast. Photograph by the author. First, it is necessary to recognize and try to understand the trauma the people of Donbas have endured after twenty-two months of violence and social strife. Long-held loyalties and affiliations have been tested under artillery fire, in the panic and deprivation of refugee flight, in the exhaustion and humiliation of checkpoint traffic jams, in the long lines for receiving pension payments and humanitarian aid. One internally displaced person (IDP) I interviewed explained that her antipathy for the separatists grew as they relentlessly shelled her small village outside Luhansk, despite the Ukrainian forces having pulled out of the town to avoid drawing down fire on its residents. This feeling persisted even though it was ultimately a Ukrainian shell that shattered her home after the separatists took the village. In Lisichansk, deep in government-controlled territory, a retired mining engineer I interviewed calmly related that he has been 100 percent for the Luhansk People’s Republic since the day a Ukrainian rocket smashed into his apartment block during the city’s “liberation,” killing his wife and daughter. I could adduce dozens more such testimonies, all highlighting the regime of violence imposed on the region’s civilians by both sides to the conflict. The searing violence of artillery strikes, which began as critical element of the Ukrainian Army’s “antiterrorism operation,” or ATO, and devolved into a vicious duel, is one of the signature sources of trauma in this terrible war. And yet it is truly remarkable how many people emerged from basement bomb shelters with their devotion to a united Ukraine shaken but intact. Two IDPs from the war-wracked city of Pervomaisk told of weeks spent in a dim, cramped basement as Ukrainian brigades fired on the city and the large force of separatist Cossack fighters within it (Fig. 3). They held their tongues around their fervently separatist neighbors and each night went to bed with the hope that a Ukrainian soldier would wake them with a knock on the basement door. When it became clear that the knock would never come, that their native city had been torn out of Ukraine, they packed a few belongings and drove the 15 kilometers to government-held territory. Fig. 2. The shelling of Pervomaisk, Luhanska Oblast, by Ukrainian forces in August 2014. From the newspaper Leviy Bereg (http://society.lb.ua/accidents/2014/08/01/274786_batalon_donbas_podstupa...). In light of the traumatized state of many Donbas civilians, facilitating their return to Ukrainian civic life should be a priority. This is particularly important for the many who suffered directly from Ukrainian military actions. Not all of them came through the experience as did the couple described above, as “patriots of the podval” (or basement, where so many civilians took shelter during the fighting). A large number are deeply ambivalent toward their country; some are even hateful. But instead of policies that facilitate reintegration, many IDPs face daily hardships and frustrations that continue to test their loyalties. Travel, for example, is a particular agony, especially for those who must frequently cross back and forth between government-held and separatist-held territories. The greatest cause of this is the dysfunctional system of travel permits and the despised checkpoints between government—and separatist—controlled areas. After as much as twelve hours in line, one frequent traveler told me, “people around you start losing the semblance of normal humanity, and so do you.” When they finally reach the checkpoint, these IDPs may face intense grilling from an equally strained and exhausted Ukrainian soldier, an encounter that in the worst cases can devolve into verbal abuse or extortion. Or perhaps they do not reach the checkpoint that day and are forced to sleep in their cars, even on winter nights. Many of them make this trip several times a month, even every week. The difficulties of civic reintegration are no less severe, if of a different sort. Many IDPs who clung to their identity as Ukrainian citizens even at the risk of violent retribution discovered that the voter registration rules for IDPs are so convoluted as to virtually disenfranchise them. Ukraine has long been in need of a coordinated program to address the needs of IDPs and front-line civilians. Its first step should be a comprehensive review of the travel permit and checkpoint systems, voting registration requirements, and new policies such as the ban on government workers visiting relatives in separatist-held areas. This review should extend to such basic policies as the economic blockade of separatist territories, which has had a profound effect on the economic security of civilians on both sides of the front lines. The true security benefits of these policies should be frankly compared with their costs in terms of alienation of citizens. Such a review should embed “do no harm” as the principle of IPD policy. It is no myth that the Donbas has a distinct political culture, one that differs even from the rest of eastern Ukraine (Fig. 4). Its residents are lopsidedly against EU and NATO membership. 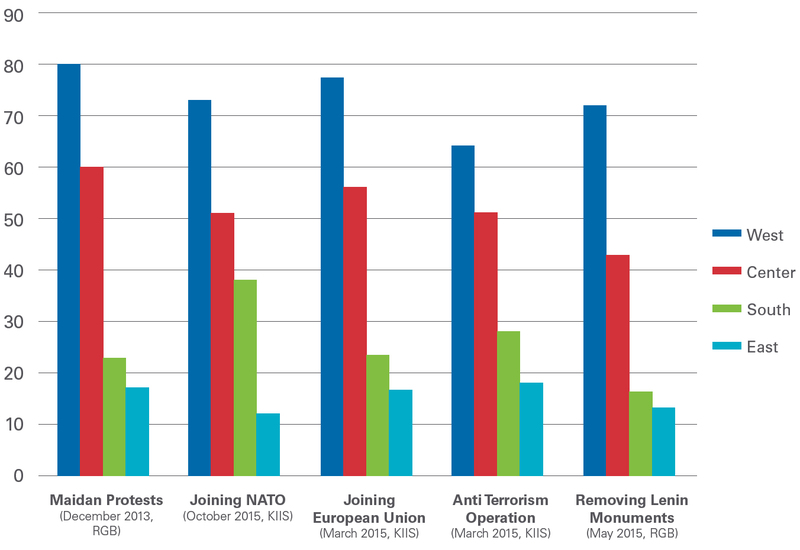 Only 17 percent expressed approval of the Maidan protests, and a dismal 4.2 percent support the ATO.1 Separatism capitalized on the profound discontent of many easterners with the direction—real or presumed— their country was headed in after the revolution. Fig. 3. Percent of support by Ukrainians in different geographic regions for events or policies of national importance. “RBG” represents surveys by the R&B Group,2 “KIIS” indicates surveys by the Kyiv International Institute of Sociology (in March3 and October4). In all government-controlled cities there exist both a simmering and barely concealed pro-separatist bloc, pining for another round of the Russian Spring, and a passionately patriotic “Donbas is Ukraine” camp, which literally has painted these towns yellow-blue. Yet between these two ends of the spectrum is a much larger, more ambiguous mass, disoriented and disenchanted but not actively supporting separatism. Whatever one may assume about their motives, this group of Donbas residents is up for grabs. Perhaps some Donbas Ukrainians would agree, such as the more than 20 percent that supported President Poroshenko’s Solidarnist party. But the majority consider that “things are really bad” not because some of the old elites linger but because of the brutal war going on around them. And polling indicates that they fault Ukraine’s current government for the fact that the war has lasted so long.7 (“My God, why don’t they just cut a deal and end this!” is another constant refrain.) To cast a vote against that war, residents of the Donbas had exactly one choice—the Opposition Bloc, the only party that at least gives lip service to their overwhelming anti-ATO sentiment. Unfortunately, Ukraine’s liberal and Eurointegrationist parties have signally failed to offer the Donbas a reform platform that is not firmly entwined with fervent support for the military effort and reverence for the Euromaidan revolution. There certainly are passionate Maidanovtsi in the Donbas, many of whom are today doing vital work in humanitarian and civic organizations. But the majority of the region’s residents view those fateful events as a tragedy or an outrage. And thus they fail the essential litmus test of modern Ukrainian politics. This is a profound error, for Kyiv needs “against Maidan/for unity” Donbas Ukrainians within its political system if it ever hopes to address the grievances that fed separatism in the region. Their intimate, agonized view of this conflict from its very beginning could be an antidote to the one-dimensional, jingoistic version often subscribed to by policymakers. In parallel with the armed conflict, the Donbas is in the midst of a culture war over the understanding of its Soviet past, which gathered steam after the May 2015 signing of Ukraine’s Decommunization Laws that legitimized the toppling of Lenin statues and initiated the renaming of streets. The wisdom of opening up the hot-button monuments question is extremely dubious at a time when Ukraine faces enormous challenges and desperately needs the engagement and buy-in of all its citizens. Those Donbas residents most likely to pine for the steady employment and relative equality of the Soviet Union, the large working class, are also those who suffered the worst in the course of the war. The opposition to the decommunization of places and monuments often takes a muted form. Though in some Donbas cities there were enough local supporters of Leninopad (LeninFall) to produce a colorful celebration as his bald visage crashed to earth, more often the square was occupied only by the camouflage-clad soldiers or public works crews that carried out the task. But online forums and social media soon simmered with frustration and anger. Fig. 4. The “last Lenin in Luhanska Oblast” (that part under government control, of course) is removed in Lisichansk in February 2016. Image from the press corps of the Petro Poroshenko Bloc. “You have to understand, being accepted into the Pioneers under the Lenin Monument, that’s one of the brightest moments many of us have from our youth,” one pro-unity businessman from Severodonetsk told me. “Now they say it was a cult to brainwash us. But I remember working hard to get there, meeting challenges and feeling part of something. Don’t ask me to say that was all a lie.” Decommunization is all the more alarming for many Donbas residents since its avant-garde has comprised volunteer battalions often associated with extreme nationalist ideology. In Severodonetsk they toppled the monument of Kliment Voroshilov, a World War II military hero and accomplice to Stalin’s terror, and adorned nearby walls with nationalist graffiti. The scribbling included the “wolf’s hook,” the symbol of the Azov battalion that many claim is borrowed from the wartime SS, and the phrases “Bandera come and bring order!” and “Ukraine above all” (in which many Donbas residents hear a troubling echo of Hitler Germany’s anthem, “Deutschland über Alles”) This was all soon slashed with red paint by pro-separatist vandals, who also took aim at the more benign message painted in huge letters nearby, “East and West Together.” LeninFall is close to its culmination in the podkontrolny Donbas. But while this symbolic gesture was carried out uncompromisingly, it is not too late for Ukraine to adopt a more nuanced approach to its Soviet past. At the very least, a moratorium on further enforcement of the Decommunization Laws should be adopted until the end of the armed conflict in the Donbas, when a more inclusive, participatory process of historical reassessment can be launched with no element of coercion. But to be successful, such a process will likely need a more profound policy change, namely, abandonment of the principle that everything Soviet must go, which remains alien to the majority of Donbas residents. Fig. 5. LeninFall in Lisichansk. Image from the press corps of the Petro Poroshenko Bloc. This assessment has painted a bleak picture of the podkontrolniy Donbas. Yet the situation is not hopeless. There are many Ukrainian patriots in the Donbas, though they do not fit the common understanding of the phrase. Most were not Maidanovtsi, and their perception of Ukraine’s Soviet past and its aspirational, European future often differs from their western and central Ukrainian peers’. But they consider themselves part of the Ukrainian nation. When faced with an agonizing choice, many chose Ukraine, leaving behind homes and lives in the separatist-held territories. It is long past time for Ukraine to address their political alienation, borne of insufficiently acknowledged suffering and ill-conceived policies. The first order of business should be a comprehensive review of laws and policies concerning IDPs and other war-affected civilians, such as the travel permit and checkpoint systems and voter registration rules, with the goal of reducing hardship and resentment by revising or annulling them. Harsh rhetoric by Ukrainian political figures, commentators, and journalists directed at Donbas voters for their “counterrevolutionary” voting habits must cease. Indeed, if the region is ever to become politically diversified, then Ukrainian political parties must stop demanding of Donbas voters’ fealty to the Euromaidan revolution or unambiguous embrace of the ATO. Finally, decommunization in its current form must be stopped, before Ukrainian history becomes so unrecognizable to the region’s residents that they cannot imagine themselves as part of its future. If Ukraine can do this, then perhaps there is some hope for reconciliation and reintegration with the separatist-held territories. Dialogue with the Russian-backed “republics” will be nearly impossible without the participation of Donbas Ukrainians, whose mutual suffering and cultural touchstones create a common space. But first they themselves must be sure of their own place in the Ukraine that is emerging from two years of revolution and war. 1 Kyiv International Institute of Sociology (KIIS), “Socio-political Situation in Ukraine: March 2015,” March 26, 2015 (in Ukrainian) (http://kiis.com.ua/?lang=ukr&cat=reports&id=511). 2 R&B Group. National Research Poll in 24 Oblasts of Ukraine and the Autonomous Republic of Crimea.(http://rb.com.ua/eng/). 4 KIIS, “What Integrational Course Should Ukraine Take: European Union or Customs Union,” European Union or Customs Union,” October 7, 2015 (in Ukrainian) (http://kiis.com.ua/?lang=ukr&cat=reports&id=556&page=4). 5 BBC, “Poll: Most in the East ‘for’ Donbas remaining in Ukraine,” March 20, 2015 (http://www.bbc.com/ukrainian/ukraine_in_russian/2015/03/150320_ru_s_donb...). 6 Denis Kazansky, “The More Things Stay the Same,” Ukrainian Week, November 20, 2015 (http://ukrainianweek.com/Politics/151996). 7 Fund for a Democratic Initiative (DIF), “Luhansk Region: Needs, Fears, Assessment of the Situation and Hope for the Future” (in Ukrainian) (http://www.dif.org.ua/ua/publications/press-relizy/luganshinapotrebnosti...); DIF, “Public Opinion in Liberated Cities: Slavyansk, Kramatorsk,” 2014 (in Ukrainian) (http://www.dif.org.ua/ua/polls/2014_polls/obshestvennavjansk.htm). 8 Evgenii Shibalov, Facebook page (https://www.facebook.com/evgenii.shibalov?fref=nf). 9 R&B Group. National Research Poll in 22 Oblasts of Ukraine and Kyiv (http://rb.com.ua/eng/).